I just finished this piece titled ‘Enjoy’. Still having fun playing with the pears and have one more in the works that incorporates a portrait. You have been given a Kreative Blogger award :-)Put that in your My Picture folder literally) by picking up the award at my place! Congratulations! I love the composition on this one. Beautiful use of color, too. 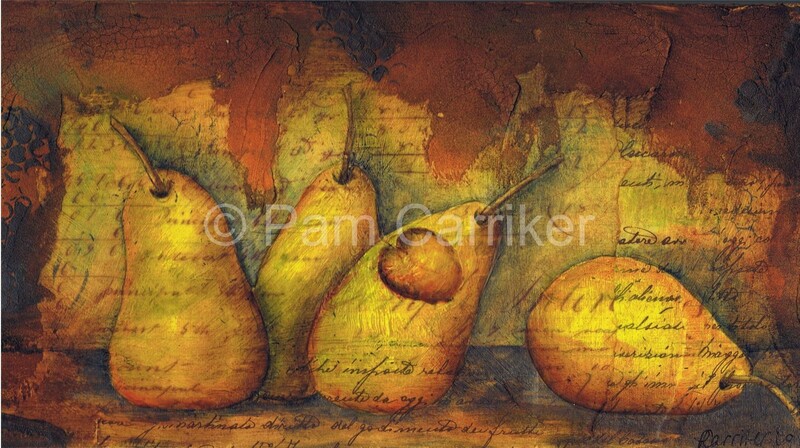 wowee pam..love those pears! there is something wonderful about pears for some reason. it was my very first watercolor painting i did so maybe that's why i enjoy seeing them in art. the colors are magnificant. have a beautiful anniversary celebration! Beautiful colors! Have a wonderful weekend!!! !